One of the more curious oddities in Santa Cruz County history was the lumber flume that ran for approximately twelve miles from the headwaters of the San Lorenzo River down the San Lorenzo Valley to Felton, where it interchanged with the Santa Cruz & Felton Railroad. Incorporated as the San Lorenzo Valley Flume & Transportation Company in August 1874, the company intended to cut timber at numerous sites along the San Lorenzo River and its tributaries, drag these cut logs to a large lumber mill near the confluence of King's Creek and the San Lorenzo River, and then float the lumber down the flume to Felton, where it would be loaded onto trains and shipped out on waiting steamships moored at the Railroad Wharf. 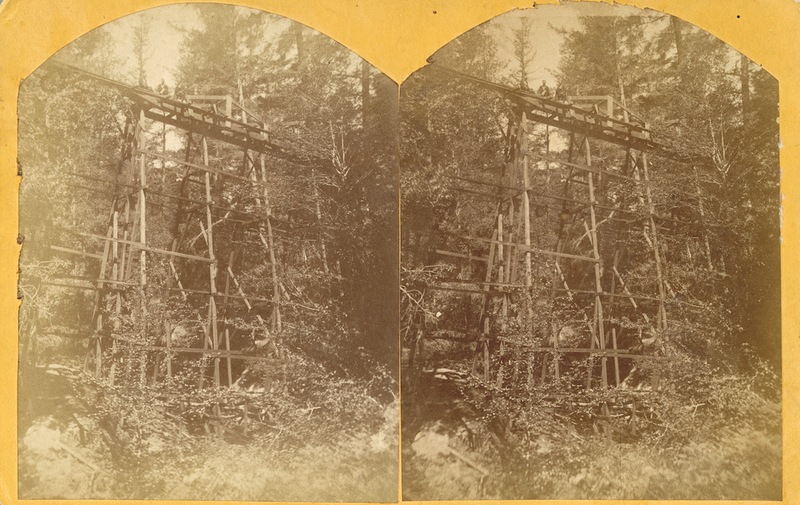 People standing atop a trestle along the San Lorenzo Valley flume, c. 1877. Photo by R. E. Wood. Construction began in early 1875 and took most of the year to complete. The mill north of Boulder Creek was built first. From here, prefabricated sections of v-flume were constructed and floated down the flume to the end, where carpenters appended them onto the existing flume. This process was continued until the flume reached Felton. Because the flume required a consistent downward grade to avoid pooling, shallow spots, or areas of varying water speed, the flume had to be relatively straight and only changed in elevation by five inches for every eighty feet. 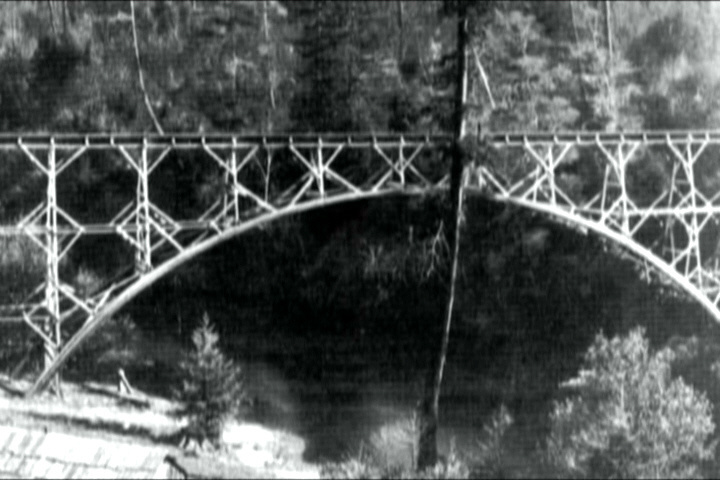 To ensure this consistent slope, large redwood bridges were built over the San Lorenzo River and other streams, some of which as beautiful arches such as one at Brackney. To ensure a steady supply of water, feeder flumes were installed up Feeder Creek, King's Creek, Two Bar Creek, Bear Creek, Boulder Creek, Clear Creek, Love Creek, Newell Creek, and other tributaries. The lack of such tributaries south of Felton was the primary reason why the flume company decided to build a railroad for the final seven miles of the route to Santa Cruz. One of the arch bridges over the San Lorenzo River along the flume, c. 1877. The flume was an immediate success. In addition to the flume company's mille, other mills popped up all along the flume's course, including the Peery mill in Lorenzo, Boulder Mill south of Lorenzo, Pacific Mills (Ben Lomond), and smaller operations outside of Felton. But with these additional lumber patrons, the flume began to strain. 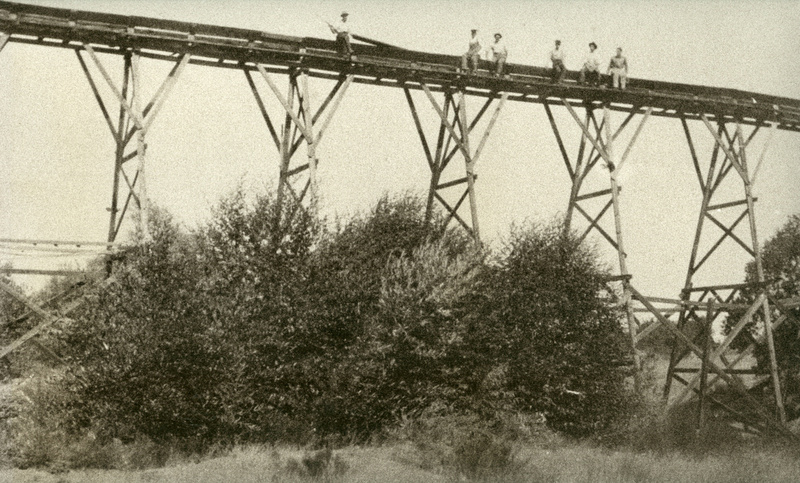 Soon after it was completed, the company realised that a 40-inch-wide v-flume could not sustain the valley's production of lumber. To make matters worse, the flume was leaky and the water supply ran dangerously low during the summer months, which was traditionally the high season for the lumber industry. A disastrous winter storm in early 1876 also severely damaged both the flume and railroad line, and storms continued to impact both in later years. In 1878, the flume company even incorporated a new subsidiary railroad with the intention of replacing the flume with a railroad line through the Santa Cruz Mountains to San Jose, although this may have just been a publicity stunt. Despite all of this, the flume served as the primary conduit of lumber between the upper San Lorenzo Valley and Felton from October 1875 to 1885. People posing beside and atop the flume, c. 1877. Photo by R. E. Wood. The flume was also popular with locals for personal reasons. From the very beginning, a sport known as flume-riding came into vogue. People crafted various boats and ride them down the flume when lumber was not floating down the line. This concept was first trialled by the flume company itself in 1875, when it used the flume to ship its work camp to a new site via improvised boats. Locals also often used the 12-inch boardwalk that ran along the entire length of the flume as a thoroughfare, despite the fact that it was intended for use only by flume walkers (people who ensured the lumber didn't get piled up) and that there was no guardrail to protect people from falling off (which happened several times). The South Pacific Coast Railroad acquired the entire flume operation in 1879 when it leased the Santa Cruz & Felton Railroad. However, management and operation of the flume likely remained with the original owners since the railroad had other priorities. However, a combination of increased demand and a decreased supply of water in the early 1880s forced the railroad company to direct their attention to the aging flume. In June 1883, the Felton & Pescadero Railroad was incorporated as a subsidiary to replace the flume in its entirety, with priority given to the seven miles between Felton and Lorenzo. Construction began late that year, but the flume continued to operate throughout this time. 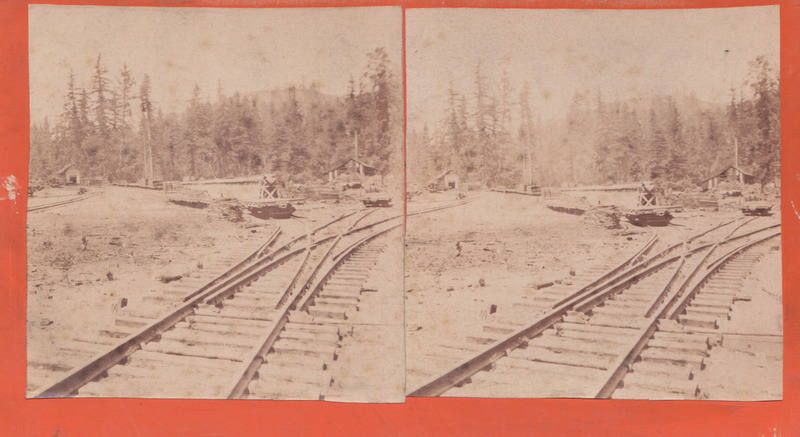 The narrow-gauge railroad route to Boulder Creek (which was chosen as a better site than Lorenzo) was completed in April 1885 and the demolition of the flume along the route was completed in short order. For another three years, a stub flume continued to exist, hauling lumber from the mill two miles north of town to the main freight yard at Boulder Creek. It was a short and temporary solution. The Felton & Pescadero had been incorporated ostensibly to connect the two namesake towns while simultaneously tapping the resources of the upper San Lorenzo Valley, Big Basin, and the Pescadero watershed. For whatever reason, this never happened. The South Pacific Coast Railroad consolidated all of its subsidiaries in early 1887 and reincorporated as the South Pacific Coast Railway, only to almost immediately lease its entire operations to the Southern Pacific Railroad. From this point forward, it seems likely that the flume passed to private hands, probably those of James F. Cunningham, a valley entrepreneur, who appears as the owner of the flume mill from this time. In 1888, the flume was replaced with a logging railroad owned by the Santa Clara Valley Mill & Lumber Company, although some of the small feeder flumes may have continued to exist for several more years. Almost no verifiable remnants of the flume survives today, although many rumors persist including that the Felton freight depot was built from recycled flume boards and that dams that supported the feeder flumes still survive along Bear and Boulder Creeks. 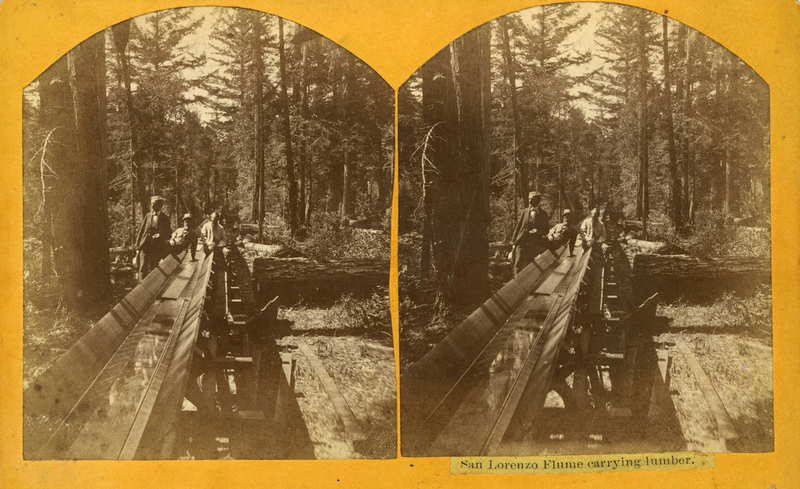 Fortunately, many stereographs were taken of the flume by Romanzo E. Wood and other photographers, allowing us to gaze back at this remarkable time in the history of the San Lorenzo Valley. Robinson, Lisa. Images of America: The San Lorenzo Valley. Charleston, SC: Arcadia Publishing, 2012. Robinson, Lisa. The San Lorenzo Valley Flume. Boulder Creek, CA: San Lorenzo Valley Historical Association Press, 2013. Rogers, Winfield Scott. "A 14-Mile Flume Brought Lumber Out Of Valley." Santa Cruz Sentinel, 9 February 1972, 6.